Various models for understanding human needs have been developed, but none is more well-known than Maslow’s Hierarchy of Needs. However, a more recent model, Max-Neef’s Fundamental Human Needs, poses an exciting alternative for our emergent understanding of economic satisfiers. 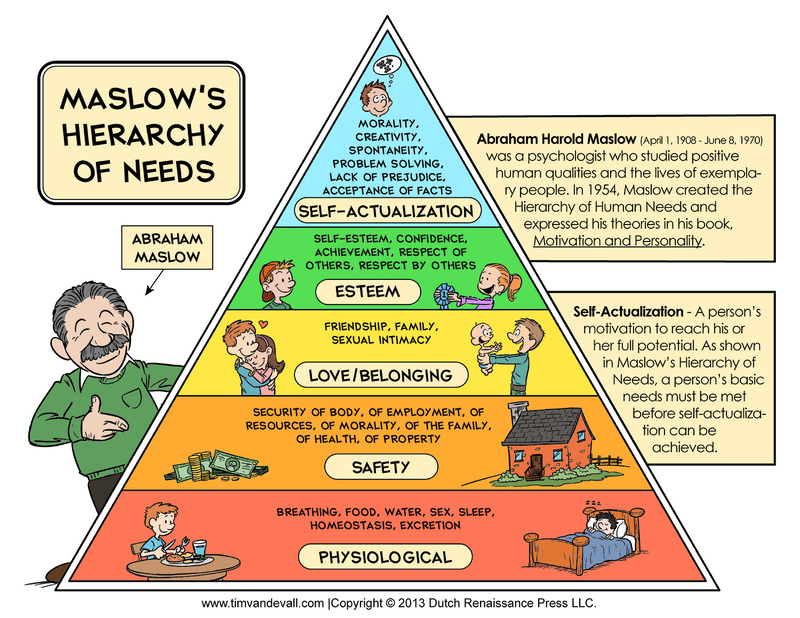 Commonly represented as a pyramid of needs, Abraham Maslow’s hierarchy proposes a linear progression through physiological needs, safety, love and belonging, and esteem to self-actualization. The most basic of needs lay the base of the pyramid, with each of the subsequent levels only taking priority when the previous level of need has been met. For Maslow there was a strict order to meeting the various human needs. These are the basic requirements for survival, without which the body will not function. Therefore, these needs must be met before any others. Metabolic requirements such as food and water, and protective requirements such as clothing and shelter, form the base of Maslow’s hierarchy. Once physiological needs are met, the individual can turn their focus to safety. Threats to safety include war, natural disasters, economic crisis, and family violence; hence needs tend to manifest in priorities such as job security, insurance, and the safety net of healthcare and welfare. Once physiological and safety needs are met, humans need to be loved and belong within a given peer group. Friendship, intimacy and family connection become the priorities. Without these needs met, people can become lonely, anxious or depressed. The need to feel respected – both by oneself, and by others – is a manifestation of the desire to be accepted and valued. Maslow theorized that a need for respect from others was a “lower” version of esteem, manifested in seeking status, recognition, prestige and attention, whereas the need for self-respect was “higher”, manifested in seeking competence, mastery, independence and freedom. The realization of one’s full potential is at the peak of Maslow’s pyramid, and becomes a priority once all previous needs have been met and mastered. Many of people’s desires at this level are very specific, and unique to the individual. While one person’s attains self-actualization through art, another’s does so through sport, and yet another does so by being a good parent. Maslow’s theory is not without criticism, however. One such criticism proposes that while needs and dives in individualistic societies are self-centred – focusing on self-improvement, with self-actualization the apex – more collectivist societies tend to be more driven by the need for acceptance and community, hence freedom and individuality are not prioritised. More specific cultural differences, as well as access to resources, also affect the priorities of individuals in various geopolitical regions. Different age groups also prioritise differently, with children having higher physical needs, adolescents having higher esteem needs, and young adults having the highest self-actualization needs. More recently, a Chilean economist, not yet a household name, has developed a scale of human needs to rival the accepted wisdom of Maslow’s Pyramid. Manfred Max-Neef’s scale is rather more complicated, but arguably more holistic, and more universally applicable. In Max-Neef’s model, human needs are understood as a system of interrelated and interactive components. There is no hierarchy, with the satisfaction of needs being often simultaneous and complementary. The Fundamental Human Needs scale proposes that human needs stem specifically from our very humanness, and are few, finite and classifiable – in contrast to the infinite and insatiable nature of economic ‘wants’. Max-Neef’s Fundamental Needs hold constant across human cultures and historical periods, whereas the strategies by which these needs are met vary between cultures and over time. The nine Fundamental Human Needs are classified as: subsistence, protection, affection, understanding, participation, leisure, creation, identity, and freedom. These needs are also defined according to a series of four existential categories: being, having, doing and interacting. These four categories, with the nine Fundamental Needs, result in a matrix by which levels of wealth or poverty can be understood. These claim to be satisfying needs while actually creating barriers to the satisfaction of needs. For example, eating junk food appears to meet a need for subsistence, while undermining health, therefore negatively affecting subsistence. These claim to satisfy needs while having little to no real effect. Status symbols are an example of a pseudo-satisfier for the need for identity, but they have the potential to subvert the individual’s attention away from their own identity. These satisfiers over-satisfy a particular need, leading to the inhibition of satisfaction of other needs. As an example, a highly secure but overprotective family leads to the inhibition of individual identity and freedom. These only satisfy a single need, and have no bearing on other needs. As an example, government welfare satisfies subsistence for those in need while having no impact on needs beyond subsistence, unlike meaningful work, which can satisfy participation and creation needs, as well. These satisfiers work to satisfy a particular need while also meeting other needs. Positive parenting, for example, provides protection, affection and identity simultaneously, without inhibiting the satisfaction of other needs.